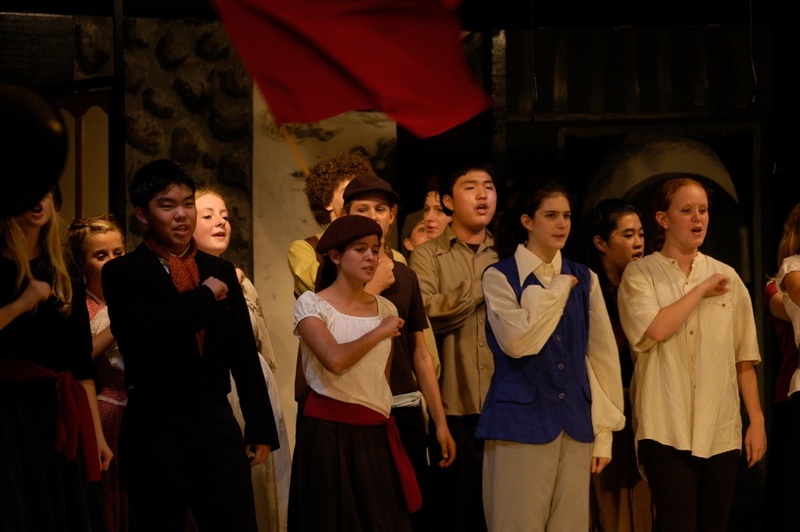 Les Miserables is a musical that carries a lot of weight for me. I read an abridgement of the story first when I was in Mrs. Hill’s grade 8 class, I have seen two professional stage versions of it, read a much longer abridgement of it twice and directed the musical twice. For me it sits at the pinnacle of what musical theatre can be. It has a story which really matters, music that grabs your soul and twists hard and it is all brought together in a package that is wonderfully exhausting and completely worthwhile. So the prospect of seeing it in a movie is something that I was, mostly looking forward to, but also somewhat afraid of. This music, this story is very important to me and I did not want to see it sullied. I loved Anne Hathaway. Her performance carried a fragile grace that is so painful to watch as it is broken. “I Dreamed a Dream” is not so much sung as torn from her by the tigers in the night. Jackman could have paid attention to her example of acting into the song without loosing the melodic thread. Many people have commented on the excessive use of close ups, I did not find this to be distracting for me. The musical is a large grand thing but it is very much the story of individuals and being able to see their faces as they sing in a way that it is impossible to when you are watching it live was engaging for me. There were some things that disappointed me. Hugh Jackman tries to act into the music so much that we sometimes loose the melodic thread. There are some expositional elements added to the songs to help the uninitiated through the story and I didn’t mind that until Gavroche goes on a narrative streak in the second verse of “Do You Hear the People Sing?” the was just pure exposition. The song that they added in during Cossette and Valjean’s ride to paris did not fit with the musical themes or the tone of the musical; it was very out of place. Javert did not bristle with the righteous intensity that his character demands and then he pins his medal on Gavroche’s dead body, I felt that that was completely out of place. Aside from Jackman’s interpretation these are relatively small things and I really enjoyed the experienced of seeing this musical on the big screen. The most important thing this movie did for me was to send me back to Indonesia, to the last time that I directed this musical. It was a small international school, I think about 40-50 in the high school and they had never had a theatre program there. Many people had trouble believing that it could be done but the talent that we had to work with was remarkable and the willingness to work hard was incredible. I remember so clearly that everyone was on stage in bare feet during a dress rehearsal and we were doing “Master of The House” and someone broke a glass and everyone just kept going, dancing around the broken glass. I remember that we had 3, well 2, wireless mics and the mic changes where sometimes had to be tricky and very quick. Kayla coming up to Song-Min right down stage, pretending to talk to him and removing his mic without anyone noticing, Jenna coughing up her mic in a bowl as she died, Sam Ee crawling under the stage to deliver his mic. I remember how great they all sounded when the chorus broke out in to full voice. I remember Song-Min holding Megan then carrying her off on a severely injured knee. I remember Ari stuffing jewelry and a giant blanket? down her blouse during “Master of The House”. I remember Korey rushing over to me to explain some disaster during a performance in Korean. I remember Peter Seow saving our young vocalists if they got a little lost. I remember “Confrontation” as Sam Ee and Johnny, our two vocal thoroughbreds went at each other. I remember the way the last note of “Do You Hear the People Sing?” ringing through the multi-pupose room until the applause broke out. I remember seeing our young inexperienced cast hear the applause and know that they had told the story well. That they had sung like angels and danced with all their hearts. It was a wonderful experience. Thank-you to all of the Papua kids who shared it with me. I have put together a little clip collection of some of the highlights of the show. Hopefully it brings back as many good memories for you as it did for me. We should not have to use things that are ugly or unwieldy, kludgy or confusing. For some time I was unhappy with the way that my blog appeared. It was dark and heavy and I think, for some people, difficult to read. I had originally chosen dark colours to make the photos stand out. Visually, I wanted the photographs to be the primary source of light on the browser image. This works great for high contrast, highly saturated images but not so well for a more muted, subtle image and even less well for black and white. Good design is very difficult to do and I am a bit of a hack at it but I feel like I know it when I see it. At least, there are objects in my life that are well designed that I love to use, that I love to hold in my hands, that have an appearance that announces its presence yet fits comfortably into the world in which it exists. Dieter Rams is really the godfather of modern industrial design and I really appreciate the principals by which he works. Take a look and listen to a few of them. He is a really interesting guy. I cannot take credit for the design of my blog. One of the reasons that I chose Squarespace to host my blog is because of the very well designed templates that they make available to the user. Very beautifully useful. I took one of their templates and tweaked it a little. I hope it works better for you and is more pleasing to use. My wife, daughter and I were up on Giant's Head Mt. in the Okanagan and we came across some long boarders who were about to ride down it. This seemed incredible to me, the single land road down the mountain was three kilometres of nine percent grade with very sharp switch back turns every couple of hundred metres. I went up and talked to them for a while and asked if it would be ok if we would take some photos and video as they went down the mountain. We went down ahead of them and waited at one of the corners. They went by a couple of times and then I asked if they had ever done a chase car so that I could record them from behind. They agreed and Madison Bucsu, a local long-board maker, drove down behind them at high rates of speed with me hanging out the window with my 7D. My daughter took all of the stills in the video with my XSi and did a wonderful job. We had a wonderful time, and as so often before the most memorable times that we have on holiday happen when we are willing to just start up a conversation with someone.